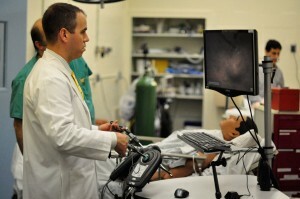 Well known in the airline industry, simulation training for residents is becoming increasingly utilized. Training on a simulator allows residents to practice their skills without any potential harm to patients. It also gives instuctors a tool to teach and evaluate residents. At Maimonides Medical Center the Orthopedic Surgery Residents use virtual simulators to practice surgical skills like arthroscopy. They can also practice management of the sickest of patients using true to life simulators. Maimonides Medical Center has developed a world class simulation center on it campus, that will allow attendings and residents to create some of the most complex clinical scenarios for educational purposes. Please send us your Simulation Training at Maimonides Medical Center questions or any questions to our friendly staff via our online Contact Form. You may also contact us at or visit our office at 6010 Bay Parkway, Brooklyn, NY 11204.